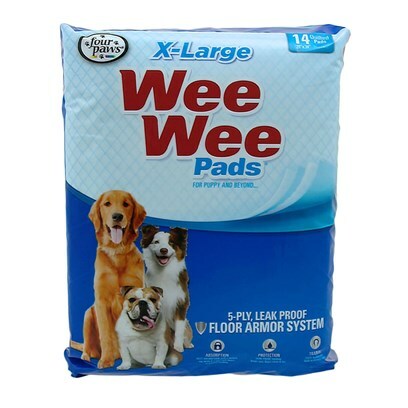 The super absorbent Wee-Wee Pad is scientifically treated to attract puppies when nature calls- they know right where to go. Plastic lining prevents damage to floors and carpets. The Wee-Wee Pad can be used to gradually train your pet to go outdoors. The X-Large Pad measures 28" x 35.5" for larger breeds or multiple dogs, and are available in four package sizes.